The biggest toy I ever owned weighed 13,500 pounds. If you have the space, I highly recommend you get yourself one too: a retired military Deuce-and-a-Half. A few years ago I saw an army truck with a For Sale sign in the window and stopped to take a look. 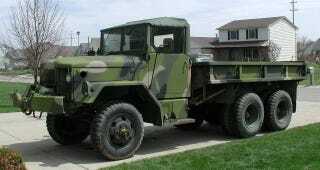 It was a 2 and 1/2 ton truck - sometimes called a Deuce and a Half - because of its off-road carrying ability. The one I saw was ratty but it got me thinking. I did a little research and found that there are several places that sell them and they aren't that expensive. I corresponded with a guy at Eastern Surplus and he had several to choose from and they were all priced reasonably. I wouldn't normally suggest you buy something by correspondence like this but I took a shot. I agreed to buy an M35A2 from him for $4,500. He even helped me arrange delivery which, if my memory serves me, cost about $500. I sent him the funds and a week or so later a flatbed truck showed up at my house with this guy on the back. The driver of the truck hopped in, fired it up, backed it down the ramp and put it in my driveway for me. Keep in mind, I had never driven one of these vehicles before. It just seemed like it would be a cool thing to have. So, I bought all the books and manuals I could find and began studying. Again, all of this stuff is easily located because of how many of these trucks were built. The Deuce-and-a-half has been used extensively for many years by the US. It has three axles and the rear axles each have dual wheels - so the truck has ten tires on the ground, being driven by three axles (the front axle can be disengaged; the rears are full-time). This particular Deuce was a 1969 AM General M35A2 with a Continental multifuel engine. It had no turbo (I had heard mixed things about those) but it did have a winch. It also had troop racks for the back which I took out. Driving with them in place caused them to rattle and this thing was already quite noisy. It also was not in good shape aesthetically. All of the pics here are of it after I repainted it. I bought the truck to goof off with and was not aiming for Concours events. So, I immediately modified the interior. The seats that come in these things were designed by the military to punish soldiers who sat in the cab. They were made of canvas stretched over oddly-angled cast iron. I replaced them with seats from a boat supply catalog. They even had handy storage under the cushions. I also carpeted the cab, after I lined the floor with noise deadening material I had found in another catalog. I think that may have reduced the noise by 1% but I never really was sure about that. Keep in mind that M35s were simply equipment to be used by the military. They were not designed for comfort. They were designed to work and to last. Many of the handles and switches are just chunks of metal. The truck has no key for the ignition. Anyone who knows what they are doing could get in it and start it. But that's the trick. The average person would have no idea where to begin. The truck has a 5-speed transmission but also a transfer case and a switch on the dash to engage/disengage the front axle. To start it, you have to flip a few switches, put it in neutral and press a button. If it is really cold out, you can use the manifold heater. The truck also had a 24-volt system and used two military truck batteries. When I got mine it had car batteries but I tracked down the proper ones and replaced them. The biggest job for me was repainting it. I found out that the typical four-color camouflage scheme for these trucks is easy to replicate. You can do the entire thing with the correct paints in aerosol cans. Again, mail order. I sanded every surface as best I could and then primed and sprayed it. The results are in these pics. I also planned to take it on a few trips so I put a lockable box in the back (that's the shiny silver you can see behind the cab in some pics. Among the things I stored were a bottle jack and an air hose. The truck had air brakes and and had a spigot under the glovebox where you could plug in an air hose. I used to check and inflate the tires in my driveway (and also mt. bike tires when I was too lazy to pump them). The engine was a Continental LD-465-1 straight-six diesel with a displacement of 478 CID. It only put out 130 HP but the torque was off the charts. I never ran it on anything but diesel but I guess the GIs who used these near the front lines rested easier knowing it would run on some kinds of jet fuel and kerosene. I had to get used to rethinking some aspects of how I thought about cars. I changed the oil on it once and besides the fact that it used two huge oil filters (visible in this picture) it used gallons of oil. I know this is not uncommon in big diesel engines but I had never owned such a thing before. There was a warning on the dash that ordered occupants to wear hearing protection. I bought disposable earplugs by the case and used them religiously. Without them, you'd probably go deaf after a few minutes on the highway. The engine was loud - the diesel stack being right in front of the passenger mirror - and the roof was cloth. Add to that the sound of ten knobby tires. I drove the truck to the Upper Peninsula of Michigan twice for mountain biking trips with my brothers. The M35 would cruise all day long at 55 MPH but it could get tedious since you had to wear the earplugs. I stopped to check the oil on one trip - which required standing on the front bumper - and I fell backwards when my shoe got caught on the cotter pin of one of the pintle hooks. Given a split second to choose between breaking something in my head or in my hand, I opted to put my left hand down. Notice how gingerly I am holding my thumb in this picture. It was broken. Up north, we had a blast with it, driving it on logging roads and looking for stuff to run over. It would go anywhere and the ground clearance was insane. The worst place I put it was on a muddy road which barely appears on the map. I decided to cut through a road which - according to Mapquest - is not advisable. From L'Anse, one can drive to Herman, but cannot drive to Nestoria without retracing one's steps. Unless one has an M35. I had been told there is a road between Herman and Nestoria but not one that a typical car can negotiate. I headed toward Herman and it began to rain. It had been raining off and on all week. Herman is smaller than it sounds and soon I was on a road which was wide enough for my truck but submerged in spots with jagged rocks and other unflat things along the way. I slowed down and rolled through everything. At one point I came to a spot where the road was covered in water from side to side. I wondered how deep it was and if one edge might be better to travel. I got out to inspect. When I came back to the truck I saw that all five of the right hand tires had sunk into the mud on the edge of the road. I engaged the front axle and put the truck in gear. No problem. I rolled through the water hazard and worked my way to Nestoria. Back home I took the truck to the Woodward Dream Cruise twice. I made my brother drive it. The thought of working the clutch in that traffic made my leg ache. He pulled the seats out of his van and set them in the back so we didn't have to use the troop racks. My truck wasn't the largest truck out there but it was fun pulling up next to the H2s and H3s and saying, "How cute! It's like a truck, only smaller!" After a few years I realized I wasn't using the truck as often as I'd like and there was also a chance I was going to move someplace where I wouldn't have the storage space for it (to fit it in my garage, I had to take the top down and park it diagonally across two spaces). I sold it to a guy in NJ who put the racks and canvas on the back and drives it in parades. I miss the big guy. I doubt I will ever own another vehicle which can be seen from space. That is my M35. A friend of mine sent this picture to me shortly after I sold it.